Surf fishing means fishing while standing on the shore or wading in the surf. 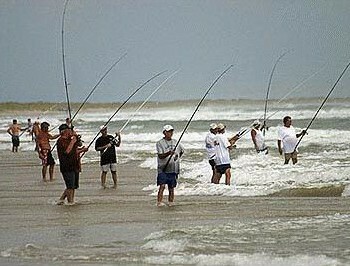 This is a very popular way to fish in Destin. If you plan on going surf fishing Destin FL, you need to pick a spot. I’m going to give you the inside scoop on my two favorite places to go surf fishing Destin FL. Be sure to stop by one of these spots the next time you take a fishing trip in Destin. I love surf fishing at the Destin East Pass Jetties. I just climb up on a boulder and start fishing. It’s important to note that you will need to have good balance if you go surf fishing on the Destin East Pass Jetties. You don’t want to fall from a boulder. That being said, don’t go if you have bad balance, and leave the kids at home. You don’t want to chance your kid falling off a boulder. If you have bad balance or want to fish with some kids, consider going to the Okaloosa Island Fishing Pier. A lot of tourists love fishing from the Okaloosa Island Fishing Pier. First, you don’t need to have a fishing license to fish from the pier. You just have to pay $7.50 fishing fee. You can also buy everything you need at the pier, including drinks and snacks. On top of that, you can rent poles when you fish here. While all of that is great, you probably want to know about the fish. You can catch some huge fish from the pier. Because of that, you can’t go wrong when you go surf fishing Destin FL from the pier. It’s always a great time to go surf fishing Destin FL. Grab your pole and get ready to have some fun in Destin.